It’s never to early to get a start on your hurricane preparation. Cities and towns on the Atlantic coast of the US are in danger of being hit by hurricanes every year. Since these storms can be fast-moving and unpredictable, homeowners don’t always have much time to get ready for a storm. That’s why being prepared for storms is key if you live in an area that’s prone to hurricanes. By having storm protection on hand, you’ll be able to secure your home, even on short notice. Homeowners and commercial building owners in Summerville, South Carolina can prepare for future hurricanes by ordering affordable storm panels for their windows and doors. At Empire Construction & Development, we provide our customers in coastal South Carolina with storm protection they can depend on. Our hurricane panels are just one of the great storm protection products we sell, and are a popular and cost-effective way to cover windows and doors before a storm. Whether your windows are large or small, standard sizes or not, we can provide you with the storm panels you’ll need to safely and effectively protect them from hurricane damage. Our aluminum hurricane panels and clear storm panels are made to withstand hurricane-force winds, flying storm debris, and hammering rain during a storm in Summerville. Aluminum storm panels are a trusted option for protecting windows – and our panels are designed with a 2-inch rise panel design that makes them approximately 25% stronger than both flat storm panels and plywood. If you appreciate the window and door protection that aluminum storm panels provide, but don’t like how they darken the inside of your home – you’re in luck! Clear storm panels are available in Summerville, South Carolina when you order storm panels online from HurricaneShuttersFlorida.com, the website of Empire Construction & Development Corp. Our clear storm panels are designed with the same 2-inch rise panel feature for extra-strength hurricane protection, and you can see through them too! Both aluminum hurricane panels and clear polycarbonate hurricane panels from Empire Construction & Development can be used with or without storm panel track. The mounting hardware needed to install storm panels in Summerville, South Carolina is included with each online order from Empire Construction & Development. Our storm panels are strong enough to protect your windows and doors, and lightweight enough to stack and store when not in use. Storm panels are one of the most budget-friendly ways to protect your home, rental property, hotel, motel, restaurant, retail store, or other building in Summerville from hurricane damage. Contact us today to get a FREE price quote on your hurricane panels order. Call:888-474-3555 with any questions you may have about buying and installing storm panels in Summerville, and to hear about this month’s storm panel special offers. Get strong and affordable hurricane panels in Summerville, South Carolina from Empire Construction & Development. Residents of Gulf County know that with the beauty of living near some of Florida’s most beautiful beaches also come the downsides of living in an area prone to hurricanes. Securing your home from these tropical storms can be stressful, but with Hurricane Shutters Florida, protecting your home and loved ones can be easy, convenient and inexpensive. Storm panels are specifically designed to be durable enough to withstand high wind speeds, and are available in a variety of colors and designs and are customizable to fit any unique space of your house. Storm Panels offer a variety of features that set them apart from other types of shutters. Our storm panels are 25% stronger than traditional plywood and are available in either a clear polycarbonate or in an aluminum finish. Panels can be installed either professionally or as an easy DIY project. Panels can be installed in two different ways: the first being through a reinforced track system where the panels secure directly onto the track and the second being directly attached to the wall with stainless steel screws. A great benefit of our storm panels are that they can be just as easily taken down for storage as they can easily be reinstalled. When not in use, storm panels can be easily stacked and stored due to their compact design. We know our storm shutters are so durable that included with a purchase is a free 5 year warranty. Our storm panels also meet the Miami Dade County and Florida Building Code approval, so you can feel assured that storm panels will protect your home. A great benefit to storm shutters is that you don’t have to wait long to secure your home. Storm panels take only 10-14 days to ship out, and are able to be installed in under an hour. Panels are available in six different lengths: 33″, 45″, 58″, 69″, 88″, 104″ and can be shipped anywhere in the world. Your peace of mind of knowing you’ve securely protected your home is worth making a call to us today. Reach out to us at (954)- 474-3557 to talk to a representative for a free estimate. You can also visit our website to read testimonials, view DIY installation videos, and visit our frequently asked questions page to read further information on storm panels. Don’t wait until the next storm hits the Gulf County area, reach out today! Hurricanes have always posed a large threat in Florida, and residents living near the coast know too well the mass destruction that hurricanes can bring. Living near the coast can be especially dangerous for houses that are not fully equipped to protect against extreme wind speeds. Now is a great time of year to secure your home from storms that can cause disastrous results to your belongings, as you never know when the next big storm will hit the Florida coasts. Bay County residents can now enjoy special Fall savings on Hurricane Shutters Florida’s signature storm panels. Our storm panels offer a great solution to protect your home as they are easy to install, inexpensive and customizable to fit any space and desired style. Panels feature a unique design that features a 2″ risen edge that allows for our panels to be 25% stronger than traditional plywood. Our storm panels are easy to install and take down for storage, making them a great DIY project. Storm panels also feature a five-year limited warranty, so you can feel secure in knowing that storm panels are a reliable way to secure your home. Storm panels are designed to not only offer the best protection, but also offers variety to match your home’s unique needs. 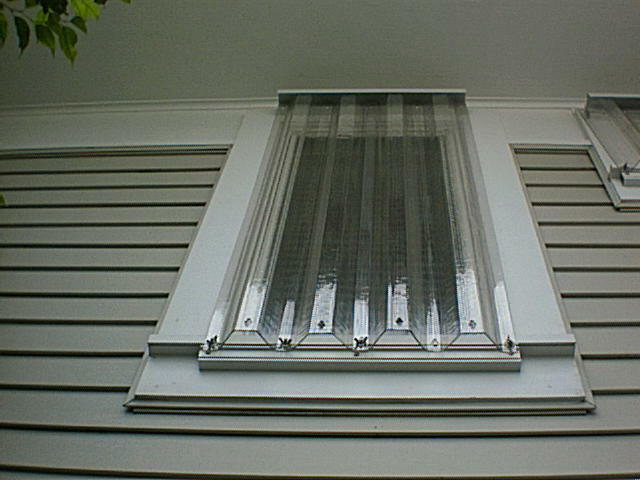 Panels are available in clear polycarbonate or aluminum and are offered in lengths ranging from 33″ – 104″. Panels can be installed either by attaching to a track or by attaching directly to the wall. Tracks are available in either a white or bronze finish. We offer only the best in durable and reliable storm panels, with all of our storm panels having met wind codes by the Miami-Dade County product control division, Florida Building code and the International Building code. Here at Hurricane Shutters Florida we strive to provide you with all of the resources necessary in order to seamlessly install your storm panels. By visiting our website, you can find a variety of installation videos for storm panels. On our website you will also find our frequently asked questions page in order to look for any further clarification you may need. On our page you will also find testimonials from previous customers with their experiences with our company and products. Don’t wait to protect your home today from future hurricane weather. Call us today at (954)- 474- 3557 for a free estimate and to talk to one of our representatives. Protecting windows and doors from storm damage is a necessity for Florida residents. Hurricanes that form in the Atlantic Ocean threaten the state’s east coast, and when these storms move into the Gulf of Mexico, Florida’s west coast and panhandle region are in danger of a direct hit. The high wind speeds and heavy rain these storms bring can be dangerous. Broken windows during a storm can be even more dangerous. To protect windows and doors on your building in Blountstown, install hurricane panels from Empire Construction & Development. *Storm panels are sturdy – Our panels are made to adhere to the most stringent wind codes in the country. If you’re looking for aluminum storm panels, get panels that are made to comply with South Florida wind code requirements – if they’ll stand up here, they’ll stand up in any storm-prone area of the US. Aluminum panels and clear panels from Empire Construction & Development are designed to be 25% stronger than flat panels or plywood. When it comes to protecting your home from broken glass, wind, and rain, don’t settle for anything but a strong storm panel. *Storm panels fit your windows – With or without panel track, our aluminum storm panels and clear storm panels can be securely attached over most windows and doors. Our hurricane panels are available in stock sizes, or we will provide you with the exact number of panels to fit each of your windows. Our clear polycarbonate storm panels allow you to see out of your windows while keeping your home, storefront, restaurant or office building secure. You can add clear panels to your aluminum storm panel order, or install aluminum panels on some windows and clear panels on others. 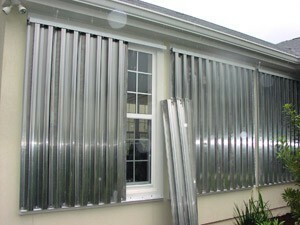 *Storm panels are affordable – If you live in Florida, you can’t afford not to have storm protection. While some storm protection products can get expensive, plywood isn’t your only choice for inexpensive storm protection – storm panels from Empire Construction & Development are a cost-effective way to secure your home in Blountstown with a high-quality storm protection product. For a free price quote on storm panels for your home or commercial building in Blountstown, contact us today. Call: 888-474-3555 with questions for our storm protection team. Keep your windows and doors safe from Hurricanes and other storms in Blountstown, FL with hurricane panels from Empire Construction & Development. The danger of tropical storms can put great pressure on families to secure their homes and businesses before a disaster strike. Wakulla County, Florida Residents especially can understand the first-hand effects that Hurricane Michael caused on their community earlier in October 2018. With more storms bound to hit the panhandle of Florida, Wakulla County residents need to make sure their properties are protected against the physical damages that these storms cause. Ordering Storm Panel Hurricane shutters sooner rather than later can protect not only your loved ones, property and belongings but also your peace of mind. Our storm panels and other storm protection products offer many safety features and are manufactured to provide the maximum protection during the storm season. We provide custom designed Storm Panels that offer 25% more strength than a flat panel through the use of our unique 2″ rise design. Our Storm Panels are extremely durable, and we have many different options of Storm Panels available for our customers. Stock size panels come in a variety of lengths ranging from 33″ – 104″. Our Storm Panels have been constructed to provide an aesthetically pleasing design, as well as provide functionality whether on or off a building. Storm Panels are designed to blend in with the building, with different options available to match the architectural style of the building. Our panels are available in aluminum and clear polycarbonate panels, and with a white or bronze finish for the tracks. 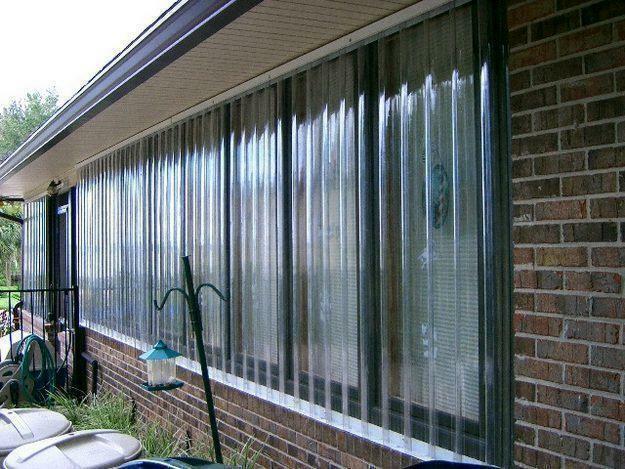 Storm Panels can easily be removed and then reinstalled when needed. When not in use, they can be conveniently stored on top of each other in a garage or other storage area. Storm shutters are easy to install and incorporate a reinforced track system with self-aligning overlapping panels that make this an easy DIY project that. 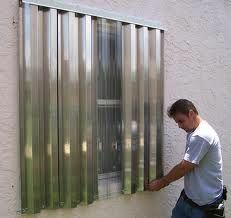 Installing Storm Panels make protecting your belongings and family members easy and can be installed in an hour. Panels may be installed horizontally or vertically, and our website provides many installation videos to guide you throughout the process. If you would rather have professional installation, our factory direct storm products can be shipped to your contractor or any preferred address in Wakulla County and other areas throughout the state of Florida. Storm Panels are extremely efficient to use and are very cost-effective. The average production time for a set of Storm Panels is approximately only 10-14 days. Additionally, we offer free estimates and special monthly offers on different products. Our Storm Panels also come with a five-year warranty as a way for us to guarantee our products protection over your home or business. Protect your property and belongings now before the next storm strikes the Wakulla County area! To order your Storm Panels online, you can click here. If you would rather speak to a representative to learn more information or receive your free quote, you can call our headquarters at (954) 474-3557. You can replace aluminum siding panels yourself if you so want to; particularly if the insurance company refuses to pay for replacement and repair is not really going to do the job for you. Unlike vinyl, aluminum is not flexible and when working with metal you should take safety precautions, wear gloves and safety goggles. You will have to gouge the aluminum siding panel and then prise it out from both sides. Because aluminum is rigid, you need to be careful about not letting it get out of shape at the locking point. The first thing to do before you get down to the job is to get replacement panels ready because very often older panels are not any longer in production. Also before you go for siding replacement check if a DIY repair can help fix the issue. Small dings can easily be repaired, buffed, and painted. A replacement does not have to be of the entire siding, a small damaged portion of the aluminum siding can be cut and another piece slotted in. Aluminum cladding protects your home from hurricanes and hailstones, it is important that the siding panels are in tip top condition at all times.